At today’s big event in San Francisco, Google confirmed what we’ve all known for the last two weeks: It has a slick looking new Chromebook, and it costs $1,000. However Google crucially expanded on those early details and has revealed a Chromebook that might actually be worth its sky high price tag, unlike the last $1,000-plus Chromebook. This laptop, which starts at $1,000, has a 12.3-inch multitouch 2,560 x 1,700 resolution display (the $500 Samsung Chromebook Pro, has a smaller 2400 x 1600 multitouch display) that works with the $99 Pixel Pen, which has 10ms of latency, 60-degrees of angular awareness and more than 2,000 levels of pressure sensitivity—that’s about average for a quality pen experience powered by Wacom, which Google partnered with on the pen. The laptop itself is 10mm thick and weighs 2.2 pounds. It’s also got a 360-degree hinge, an all glass back, and a USB-C port. It also comes in Intel Core i5 and i7 flavors and comes equipped with 16GB of RAM. For storage it starts at a whopping 128GB and goes up to 512GB. That’s twice the storage that the previous Google-made Chromebook had and four times the storage of the Samsung Chromebook Pro. And the new Pixelbook is going to need all that extra storage, because this is the first Google-made Chromebook to actually have apps. Those apps come courtesy of Chome OS and its blend with Android. 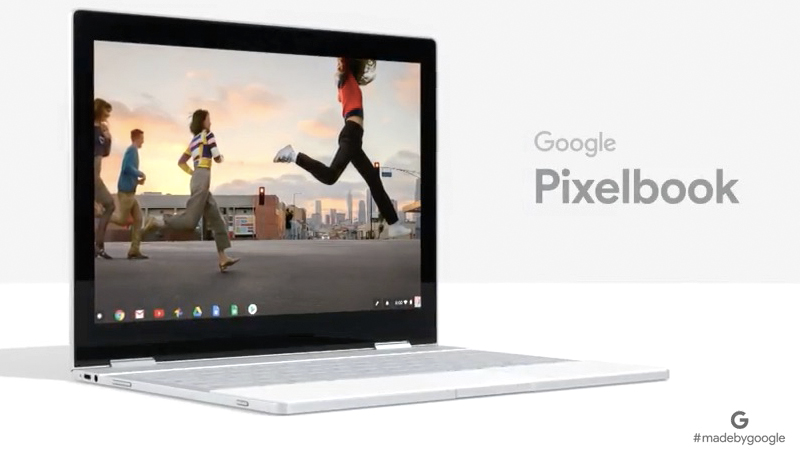 The Pixelbook also features “Instant Tethering” where it immediately connects to your phone when other Wi-Fi is unavailable, and Google Assistant is built right in. Pre-orders for the Pixelbook start today and will be in stores October 23rd.